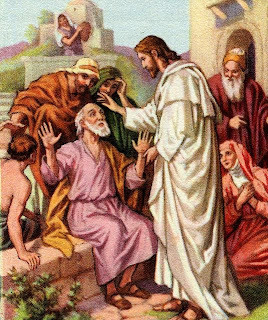 Last week's Gospel reading (Mark 10:46-52) was the story about Bartimaeus, a blind man who's persistence led Jesus to restore his sight. Just about every homily and sermon I have heard on this passage highlights what great faith Bartimaeus showed. This is true, of course. People all around him were shouting at him and telling him to keep quiet. But he persisted. He kept calling for Jesus. That in itself is a beautiful lesson for all of us. But the part that always gives me pause is what happened next. Jesus asked Bartimaeus "What do you want me to do for you?" Oh how I wish he had been like that thief crucified next to Jesus, and asked for a ticket to Paradise instead! I always wondered why this poor man wasted his "one wish" on such a physical, worldly thing, when he could have asked for something so much greater! After all, his sight came with an expiration date. But a place in the Kingdom would have been forever! Of course, every time I lament about his "wish", I realize that there have been plenty of times in my life where I did the exact same thing. Times where I asked for - or worried about - silly things. Meaningless things. Times I pestered God for things that He knew weren't important. Times I should have been "asking" God for a seat at His table instead. And so, whenever I hear this passage, I stop and thank Bartimaeus for giving me a lesson in persistence. And then I thank him for, inadvertently, giving me a good dose of perspective as well. Magnificent sentiment Michael, providing much needed perspective on my prayers. We are know that Our Father can do anything, that He loves us so much and yet we ask for little things. Certainly He is concerned with the small things in our lives, but something tells me big prayers - like asking for salvation for a soul in peril - please Our Fatherly very much. Happy Feast of All Souls! Please say a Hail Mary for the souls in purgatory. Michael, a read this and reread this and it made me think. We ARE presented EVERY SECOND of our lives with His question. Every thought we have, every person we encounter, every thing we eat drink and do. Our lives answer this question in every breath. What is our answer? I like what St. Alphonsus Ligouri prays: O Lord, increase in me your love, that I may love You as much as I am able, and then do with me what You Will. HC - now if I were as clever as you, I would have tied this post into All Souls Day like you did. And you are right, praying for those souls is even more important than asking for a seat ourselves. Great point! Shirley - thank you for sharing that thought. You are so right. It's important to pray that God guide us to do His will - not our own! Good evening Michael, This is a great post! I think we all pray for silly things at one time or another. It's true. 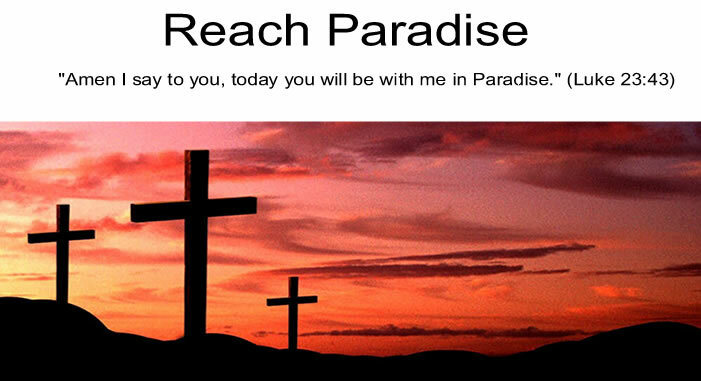 Nothing is more important than reaching paradise. All of this other stuff is nonsense. Thank you for such an inspiring post. Thanks, Carol! Hope you are enjoying your break! What a great point you make. Bartimaus missed out; so do most of us. Limitation of human thinking, I suppose. Thanks for stretching my thinking today!